This technical note will provide step-by-step instructions of how to retain Bates Numbers from previous productions when Bates Numbers will be overwritten. The Bates Range of documents in a Production Job being prepared, and Privileged documents withheld, is not determined until the job is completed. It's a common practice to have different Bates prefixes for associated productions to allow independence of Bates ranges. a- Run one production at a time. In this case, you will get the Bates Range (for produced and withheld documents) on completion and that range can be used to generate the start of the next production. 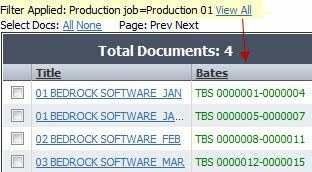 The existing Bates Range section in the Production Job page helps you keep track of existing bates sequence, prefix and range as well, from previous productions. If you need to re-run a production for some reason (e.g. 'needed to add more files to production', etc. ), you can simply start a new production from scratch. Each production run will set the Bates Number and if a document was part of a previous production, its Bates number will be updated to reflect the latest production. The Bates Number shown on the Browse, Search and Document Viewer pages reflect the Bates Number the document was assigned in the last production. Also, if you run multiple productions, the Bates Number for any document is stored with the production so you can download it multiple times and it will retain the bates number that it had when the production was first created. b- If productions are run simultaneously in different cases (only one processing can be run at a time in a single case), then a different Bates prefix can be applied. For example if your first production has a Bates prefix of 'ABC', then the second production could start with 'ABC2' or the like, and number 1. 2) From the Management>Manage Custom Doc Field create custom field section for 'Prior Bates Numbers' and coding sections (text-box for Production leading letters, e.g , TBS, DEF, LMN). 3) Use Excel metadata update to copy the Bates leading designation and the number (with leading '0's into custom field 1). 4) Concatenate the columns using leading '0' (e.g. '=C2&" "&"000000"&D22 the number'). The number of 0s will need to be adjusted as the number increases. After creating the number, the field in Excel needs to be copied with a 'copy values' step. 7) Create and run Production 2, etc. NOTE. In the option above, the Prior Bates number will be available in the Doc Viewer and in Browse. Without doing this the Prior Bates number will be available as part of a production download in the range, or the actual documents if not deleted. We also offer Project Management and Technical Services if engaged to support your productions efforts by helping to execute specific requests for bates stamping projects. Please contact your sales rep or our Support Center if needed.